Jackie Evancho, Toby Keith and Sam Moore. President-elect Donald Trump's inaugural festivities will provide many performers with the largest stage of their careers so far. The eclectic lineup ranges from rock and country stars (Toby Keith, 3 Doors Down) to rising pop and jazz vocalists (Jackie Evancho, Lexi Walker, Erin Boheme) to classic performers with enduring hits (Lee Greenwood, Sam Moore). 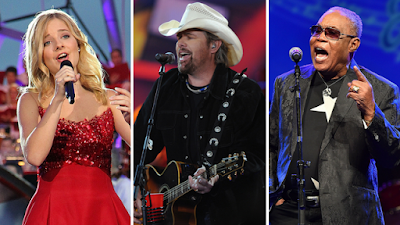 Here's a look at the ten performers taking the stage in D.C. this weekend. The 16-year-old classical-pop singer placed second on America’s Got Talent in 2010 when she was just 10 years old. In the years since, she's released an EP and six albums and performed for President Obama twice. The country singer is arguably the biggest name to perform at the inaugural celebrations, with a songbook full of tracks celebrating the military, the American flag and our country's freedoms. The 74-year-old singer-songwriter will travel to D.C. to perform his signature song God Bless the USA, telling Rolling Stone that Trump will make a "great president." The band returned last year with Us and the Night, their first album in five years. One half of Motown legends Sam & Dave, Moore explained in a statement that while he "was a participant in the civil rights movement...I know we must all join hands and work together with our new President." The instrumental group will perform three times during inauguration weekend, telling Forbes, "We are here not to be political, we're here to be patriotic." The Indian-American has provided musical accompaniment everywhere from the Academy Awards to the Super Bowl, telling the Tampa Bay Times that "it's time for America to come together, Trump will be president, and that's it." The country singer will soundtrack Trump's first dance as president at the Liberty and Freedom Balls, debuting his new jazz act, Tim Rushlow & His Big Band. The 14-year-old YouTube sensation will perform for Vice President-elect Mike Pence, singing for his first dance at the Liberty and Freedom Balls. The jazz singer, a previous collaborator of Michael Buble, rounds out the lineup of the Liberty and Freedom Balls.